Agricultural livelihoods affect nutrition of individual household members through multiple pathways and interactions. This ultimately raises the question: how might these different routes translate into activity implementation? Two Feed the Future activities, the Integrated Improved Livelihoods Program (IILP) and The Rwanda Dairy Competitiveness Program II (RDCP), provide an opportunity to examine alternative approaches to reach the ultimate goal of improving livelihoods and nutritional status. 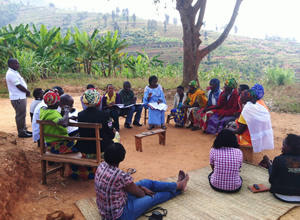 In this webinar on April 30, 2015, presenters unpacked how two agricultural livelihoods and food systems investments strive to improve household nutrition. SPRING highlighted its recent study documenting IILP’s and RDCPII’s different approaches to considering and integrating nutrition into their activities, and Waringa Kibe of IILP and Frank O’Brien of RDCPII shared some of the key challenges and successes in their work. Joseph Lessard of the USAID/Rwanda Mission also reflected on lessons learned in the first phase of Feed the Future implementation.